Winter has given Carlos Watson, a maintenance worker at the University, a special reason to appreciate his job. “It’s satisfying, knowing what I do helps make this part of the University look better,” said Watson, as he went about his morning chores in Real Estate Operations, tidying up the outsides and insides of five apartment buildings owned by the University just west of the Medical Center. Watson found a job through the University’s Career Pathways Initiative, which the University and its Medical Center organized in partnership with the City of Chicago’s Department of Community Development (formerly the Chicago Mayor’s Office of Workforce Development), and The Cara Program, a leading nonprofit agency that provides intensive training and support to workers who have limited employment experience. The initiative was born when the University approached the city to bring workforce development to the South Side. Watson is in charge of keeping the apartment buildings’ sidewalks and hallways clean, sprucing up the doorways each morning by polishing the brass hardware and checking on the boilers. Winter takes its toll on residential buildings. “I was awake at 3 a.m. this morning, just thinking about what would happen if there was snow today,” he said on a recent morning as he gathered castaway bulk mail from the floor of a building on Maryland Avenue. Outside, flakes were falling and Watson was thinking about shoveling. “We have to get all the stairs and sidewalks shoveled by 8 a.m., and then we go and do the backs of the building,” said Watson, who was on his way to check the boilers of a nearby building. Like clearing sidewalks, checking the boilers is another necessary task that few people notice unless it’s not done and something goes wrong. Watson found the center through multiple Internet searches. When he came across a link to Career Pathways, he knew he’d found what he was looking for. Because he already had experience doing maintenance work, Watson was placed in a temporary position at the University after participating in a few workshops at the Career Pathways Resource Center, 950 E. 61st St. in the Woodlawn Social Service Center. That temporary job quickly led to a permanent assignment, a promotion that is part of the goal for participants in the program. So far, Career Pathways has placed 128 mid-South Side residents in jobs. Some found the program through computer searches and others through personal contacts and referrals. Some have experience, such as Watson, but others enroll in the full-time training at The Cara Program, which provides career preparation for people who have limited job experience. The Cara Program recently received the Chicago Community Trust Outstanding Community Strategy of the Year Award for its success in addressing the challenges of poverty and barriers to employment in the mid-South Side. The University launched the initiative in October 2007 in partnership with the City of Chicago and The Cara Program. Its early success is greatly the result of the power of collaboration, said Sonya Malunda, Associate Vice President of Civic Engagement. 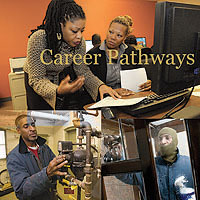 For more information on Career Pathways, call the resource center at (773) 752-0687 or visit http://www.careerpathwayschicago.org. For more information on the DCD or for a referral to a WorkNet Chicago location, call (312) 746-7777 or visit http://www.cityofchicago.org/dcd.